Please ensure the balance of the payment for the karts are done before Sunday. Since we are number one does that mean we are the most outstanding team ever? does any1 have a spare helmut? Thank you for an epic event . I didn't do the gokarts (let's be honest now I look ridiculous I them) so I just went for for the car event afterwords, witch was more to my liking until my coil blew. But nevertheless epic fun. We came in hoping for a podium finish in our first ever semi offical race. Karts none the less. We pulled cart 6 which started us up in front of the grid. Unfortunately with the centrifical clutch system and my epic weight of 110kg the Kart crawled off the line and before i got round turn 1 found myself in 5th. Yes its endurance so this did not matter much as i knew the lightweights would fly by. After our first driver change we found ourselves up to 2nd. And from third change we were leading the endurance. We couldnt believe it as we are novices. But alas we grew our lead constantly to a point were we were over 40sec ahead of 2nd place where we decided to just maintain such a lead for if we needed to unexpected pit. Well in my final stint i thaught to hell with it in gonna push. I was lapping karts lap after lap until we got to lap 88. I lined myself up to pass a slower cart around T1 and halfway through found myself connecting with a backmarker who spun out. This was a hard knock. So hard it threw me out the cart and my cart ran over my leg. Never the less racing is racing. I ignored the pain and jumped back into the cart to get going. And as i got in the cart i found the motor died. Calling the marshall to restart my motor he waited for traffic to cross the track. Only to find the shunt damaged the motor and the pull start had jammed. Now all i could think was our lead just falling away. Then the marshall said we need to move to a safe spot towards the inside of the corner.. tick tock no yellow flag. So we wait for traffic..eventually get the kart to a safe spot. He then called in the kart damaged. And told me to go get a spare kart. So i ran jumped the fence and rant to get a kart. Found my team mate getting into the now allocated 1 Kart which had already retired with issues. Alas he soldiered on to not lose more time. And brought it home in 3rd. We happy to have got a Podium finish. But damn. We had it in the bag. But ya thats racing i guess. Its not over until its over. What a great day at the Z.
Karting as always was fully booked, and the closest racing ever for us. 3 karts finished on the same lap, (109) with 1.9 seconds separating 1st and 2nd! Well done to Team REVO on taking the win! Fastest lap set by James, of 1.00.15. Plenty of exiting spin outs and wheel to wheel racing! One of the comm will upload the full results sheets when we get them from the karting offices. The gymkhana was unfortunately poorly attended, and we closed up at just after 3pm. The new format we adopted last year of head to head is great to watch and very competitive ! The new record of 57.99s was equaled by the Celica GTfour, and Steven the driver also took home the prize for most impressive lap, getting the Celica into some crazy four wheel drifts! There was a great atmosphere on the day, and it was great to also get the UP around the track for a few laps. We look forward to seeing you at our next official event, My Car Got Shot V2.0 on 28 May 2016! Thanks VWCSA for an awesome event! I had a great time!! I had an absolute blast! I arrived abit late but it was awesome to see how competitive the guys were with the karts! Had some good laughs! The gymkhana was super fun for me and I had a blast! Thanks again to the comm for organising everything! EX> 85' Mk2 Gti 16v 2door.. The DUB. EX> 93' Mk3 2.8 VR6 2door...The Pig. 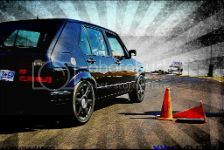 EX> 87' Mk2 Jetta CLX .:R32.. The karting is one even on the VWCSA calendar which I look forward to every year, and this year was no different. After @Brotiform and I had such a great race last year, bringing our kart home for a win, I was itching to get out on the track again and improve on my competitive driving. Unfortunately, Brotifrom ran in to some issues and couldn't make it yesterday, so I arrived for Team Tonsil on my own. I obviously couldn't do the race on my own but the club chairman, @IanF came to the rescue and offered the services of two committee members, Wes and Chris, which I quickly accepted as I was just keen to get on track and race. Unfortunately, I pulled kart number which, which although it turned out to be a fast kart meant I was starting from the back of the grid, in 9th place effectively. I had the third fastest lap on the day, behind James and Jody, and as a team we managed a fourth place which considering we started from the back row and Wes and Chris weren't planning to race, I was happy with. I wish Brotifrom could have made it but I had fun none the less and must give a big thanks to Ian, Wes and Chris for pitching in and allowing me to race. I can't wait for next year, I know a few area's that I can make up some time, so I can chase James and Jody down. It was also great seeing a lot of old and new friends, catching up, having a laugh, etc. So a big thank you to the club and it's committee for organising the event and keep up the great work. Was an awesome event, thank you to everyone involved. The beetle did not like the kart track, tight corners and a solid spool axle does not work. Also had some issues with the gearbox jumping out of 2nd gear. Driving with one hand on the steering and one hand on the gear lever keeping it in 2nd is challenging. .
4agedub wrote: Was an awesome event, thank you to everyone involved. Thanks, that caddy is really quick and seems to handle pretty well!!! Neuk wrote: The karting is one even on the VWCSA calendar which I look forward to every year, and this year was no different. After @Brotiform and I had such a great race last year, bringing our kart home for a win, I was itching to get out on the track again and improve on my competitive driving. Unfortunately, Brotifrom ran in to some issues and couldn't make it yesterday, so I arrived for Team Tonsil on my own. I obviously couldn't do the race on my own but the club chairman, @IanF came to the rescue and offered the services of two committee members, Wes and Chris, which I quickly accepted as I was just keen to get on track and race. Unfortunately, I pulled kart number which, which although it turned out to be a fast kart meant I was starting from the back of the grid, in 9th place effectively. Thanks for spot nick, I had some great fun, although it being my first time, I didn't do too bad I hope, I however have lots of practice to do and will absolutely be competing next year. It was fun sliding around corners although that not being the fastest method to go around a corner. Great to see everyone again after being racing and work commitments. Has anyone maybe got the final results for the gymcana? I was not able to stay to the end to see the results. 4agedub wrote: Has anyone maybe got the final results for the gymcana? I was not able to stay to the end to see the results. Will be compiling and uploading today hopefully. Gielie01 wrote: Thanks for spot nick, I had some great fun, although it being my first time, I didn't do too bad I hope, I however have lots of practice to do and will absolutely be competing next year. Pleasure gents. I think we did well considering we started from the last row and had two complete noobs. I had a quick scan of our lap times and we weren't that slow at all, just inconsistent except for spinning out, lol! Barney wrote: PS Mr Catt why so slow?